Since April my putter of choice has been Seemore's X3 putter. I've had the chance to test out this beautifully designed mallet putter with a distinct nickel finish both at my regular golf course, Rideau View and at a few golf courses I frequented this season for various golf course reviews including Deerhurst Resort, Muskoka Bay Club and Lora Bay Golf Course to name a few. The X3 putter is part of SeeMore's xSeries, which features a few new options from SeeMore. They've combined the proven RifleScope Technology (RST) in a series that also combines both cast and milled materials, along with stainless steel and a lightweight TPU insert for feel and control. I've always loved the look of a mallet putter and the X3 is no different. The mid-sized X3 definitely instills confidence when you address the golf ball. The nickel finish like that of the Si Series is both esthetically appealing and durable. The size/weight of the X3 I liked a lot and for me was similar to the SeeMore M3 that I purchased off eBay a few years back and still game on occasion. The x3 has one single perpendicular line on the top for simple alignment with the ball and target and two perpendicular lines on the back flange for additional alignment benefits. RifleScope technology, the patented and proven alignment system featuring 2 additional parallel white lines and a signature red dot on the top heel of the putter, helps the golfer establish a set up and stance that is then perfectly squared up with the putter and the target line for consistently greater performance on the greens and benefits during practice. Visually I really liked the look of the SeeMore on the face of the putter and on the cavity. 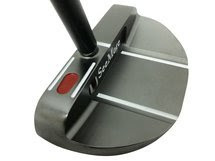 I've reviewed both the Si1 and Si4 putters from SeeMore that have inserts. The lightweight TPU insert in the X3 differed from the Si1 and Si4 in that I found the X3 to have a better and more consistent feel especially on longer putts. The reason for this can be traced below to what SeeMore has done with this new insert. The xSeries features a new lightweight TPU insert, which is poured into a special designed face cavity and then allowed to harden and bond with the stainless steel material. The whole face of the putter is then milled giving it a consistent look. With the Si models you could actually see some separation between the insert and the putter. The X series is seamless. This is where as noted in previous reviews SeeMore excels. Being able to customize your putter from the length, lie angle, grip and headcover will only help you make more putts. Whether you use one of SeeMore's SPI instructors or you speak to a SeeMore representative via phone/email on what type of SeeMore putter to game. You will not only get some of the best customer service you'll come away a more knowledgeable putter. 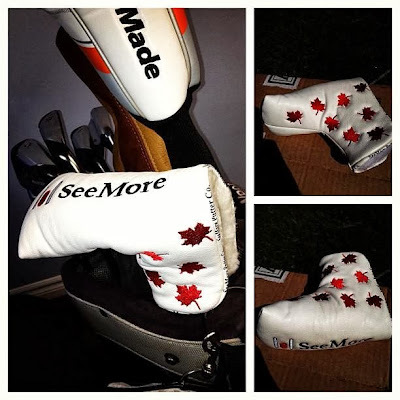 Ted Gallina from SeeMore was nice enough to send later on in the season a beautiful Maple Leaf headcover to complement my X3. SPi Instructor, Paul Contento of Litchfield Country Club, talking about the importance of getting fitted correctly. The SeeMore X3 was the best feeling insert I have used. With it's midsized head shape and nickle finsih the X3 frames the ball beautifully. I had the pleasure of testing out the X3 at various golf courses and in a variety of weather conditions from early this Spring through the Summer and now into the Fall. On fast greens it performed beautifully and on greens with marginal to subtle breaks it was outstanding. I even got my handicap down to under 16. SeeMore's X3 had a definite hand in that. The X3 retails for $195 USD and can be purchased at SeeMore's online store. SeeMore excels when it comes to customer service, you can call/email any questions that you have. They are more than willing to help you become a better putter.